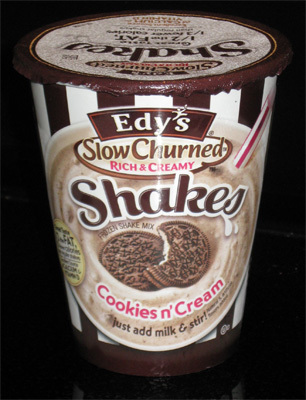 More of the NEW Edy's slow-churned shakes! Well, I knew those new Edy's shakes wouldn't last long. I love new products and I love shakes, so I really wanted to dig in and see all that they had to offer... even though I found the vanilla shake ok, but it could have been so much better. Being one of those fancy schmancy people that can't be pleased with just chocolate or vanilla (hehehehe), I made Cookies n' Cream my second test subject on Tuesday. Oh how I love CnC milkshakes. Hmmm, you know, I think I like how this looks, it has promise. 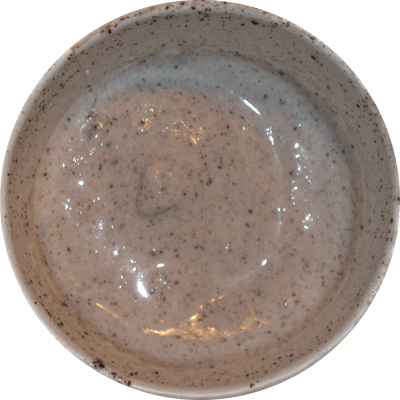 Well, it sure looks likes a standard CnC shake. I break out my straw and it's pretty good. Sure, it's still suffering from some minor ice chunks and the consistency isn't perfect, but I like it. I great thing about CnC is that it's pretty hard to mess up as long as you put a half decent effort in. 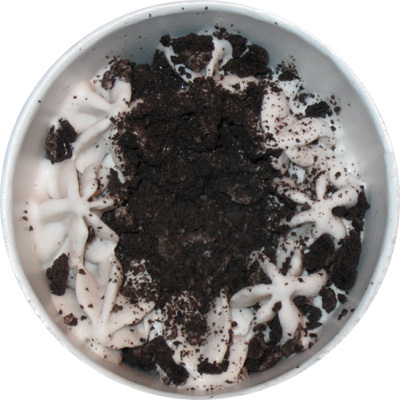 Worst case scenario is you don't get enough cookie bits, but that's not a problem here. Friday is the night I'm most likely to be up late, and what better way to recharge my batteries then with a really chocolaty shake. You see my friends, I have a plan that has been percolating in my brain all week long! 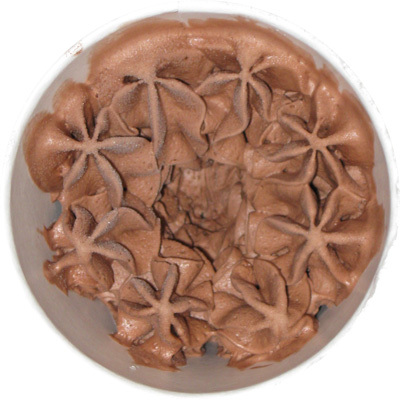 Think about it... what evil thing could I do with this cup of chocolate slow churned ice cream? OH YEAH! I dumped in some 1% organic chocolate milk! I couldn't help myself! Sure, it will skew the results of the final taste test, but I just couldn't help myself! I stirred up my treat and boy is it chocolaty. I'm thinking the base chocolate was already more than chocolaty enough without me helping and in retrospect, the chocolate milk was totally uncalled for. 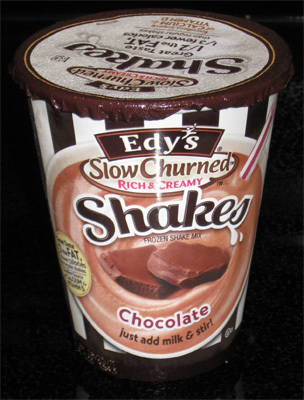 I'm not a huge fan of Edy's slow churned chocolate flavor, and yet again we suffered from small, straw-jamming ice crystals and the consistency isn't perfect, but it wasn't bad. Overall, I think these treats are $1.50 ok.... It may be $1.25 decent, and I would have trouble arguing if it was a good treat for only a $1... wow, I must be getting old if I'm arguing over a quarter or two, but hey, 50 cents use to buy me an ice cream sandwich. I guess I just want you to know that a $1.50, you are probably likely to try these, but at a $1.50, I just don't see the long term commitment here --- oh, you know what would be awesome? a 6 pack for $4! Now those would sell like hot cakes! and I love hot cakes! Nice review Dubba. I'm yet to see these. What are the nutritional values on these things? I see all sorts of possibilities.. Mixing the smoothies with vodka.. the milkshakes with rum..
ok, nutritional values are up, though not 100% complete. 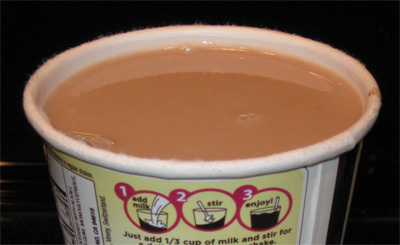 you know, I totally forgot about the possibility of coke floats with these things. Cherry coke and vanilla maybe? root beer and cookies n' cream?